Circulating Now welcomes guest blogger E. Thomas Ewing, Professor of History and Associate Dean in the College of Liberal Arts and Human Sciences at Virginia Polytechnic Institute and State University. 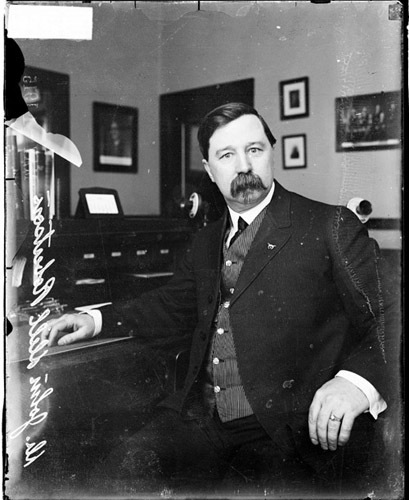 Professor Ewing’s recent research in the historical collections of the National Library of Medicine includes new methods of analyzing textual information. Professor Ewing is the Principal Investigator and Project Director of “An Epidemiology of Information: New Methods for Interpreting Disease and Data,” funded by the National Endowment for the Humanities through the Digging into Data Challenge. NLM was pleased to be a co-sponsor of the recent Epidemiology of Information research symposium, in cooperation with the Office of Digital Humanities of the National Endowment for the Humanities, the National Science Foundation, and Virginia Polytechnic Institute and State University. The proceedings of the symposium, in the form of a final paper, are available here. —“100 Sailors at Great Lakes Die of Influenza,” Chicago Daily Tribune, September 23, 1918, p. 1. Despite this seeming contradiction between his initial optimism and the actual impact of the Spanish influenza epidemic, Dr. Robertson remained convinced that his approach to the disease had been correct. Dr. Robertson’s response to the Influenza Epidemic of 1918-1919 provides a case study for exploring the relationship between the statements of public health officials and the ways that newspapers shaped coverage of the influenza within particular communities. This research is part of a larger project, entitled the Epidemiology of Information, which seeks to understand how newspapers shaped public opinion during the 1918 influenza pandemic using collections from around the country, including those held by the National Library of Medicine, Library of Congress, and the online Influenza Encyclopedia. 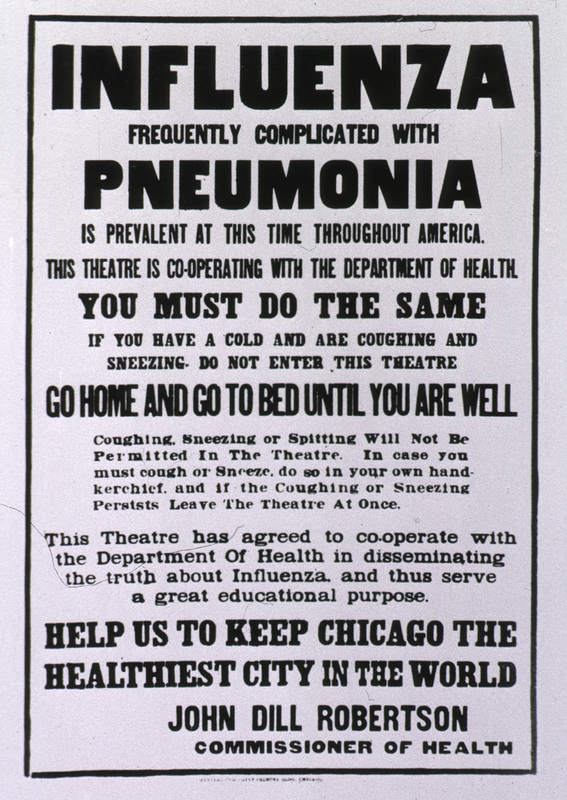 In his report, Robertson described how his office provided “daily information as to the status of the outbreak, together with advice and warning as to the things that should be done to curb the spread of the disease and to protect the public health.” Newspapers also printed daily warnings, often in the form of “Do’s” and “Don’ts,” which were distributed by the Department of Health. 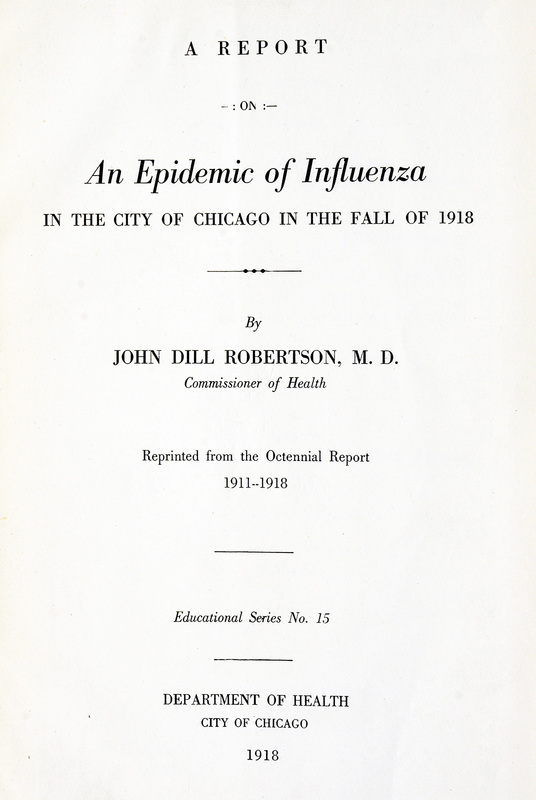 To explore the nature of Dr. Robertson’s statements about influenza as the disease approached Chicago, reached peak levels, and then gradually diminished, I have extracted direct quotations from Dr. Robertson that were published in one newspaper, the Chicago Daily Tribune, between September 19 and October 26, 1918. In total, this newspaper published direct quotes from Dr. Robertson in fifteen articles, with just the quoted statements adding up to more than 1000 words. One way to look at this large amount of data is to visualize it in a tag cloud which highlights words that appear most frequently and therefore provide insight into the kind of language used by Dr. Robertson. 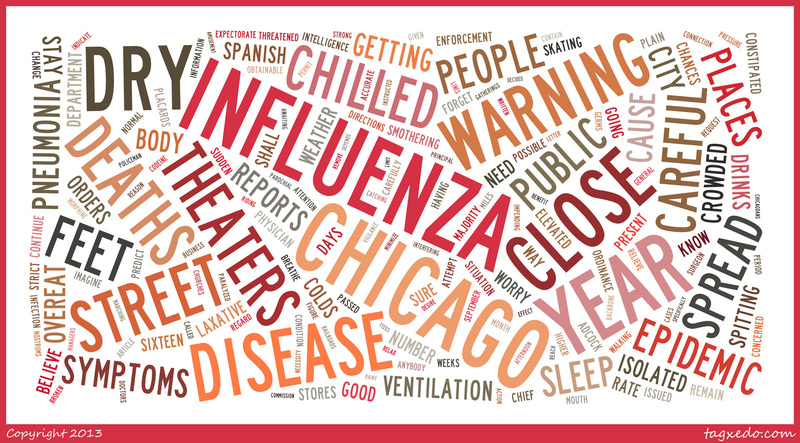 Words such as influenza, disease, spread, epidemic, and symptoms suggest the centrality of medical terminology in these quotes, while other terms, such as theaters, close, schools, sweeping or street refer to potential public health measures to safeguard public spaces. —“Army Students New Victims of Influenza,” Chicago Daily Tribune, September 21, 1918, p. 1. —“How to Avoid ‘Flu’,” Chicago Daily Tribune, October 3, 1918, p. 1; “Spanish Influenza. ‘The Flu’,” Chicago Daily Tribune, October 3, 1918, p. 24. —“Health Officers Find Influenza Epidemic Waning,” Chicago Daily Tribune, October 7, 1918, p. 1. As this limited analysis suggests, developing new methods for analyzing newspaper reports about the spread of the Spanish flu has great potential to address a key historical question: How do public officials respond to an unprecedented outbreak of contagious diseases in particular contexts? For scientists in the field of epidemiology, these responses can be evaluated in terms of the relative success in achieving the goals of containing the spread of disease, ensuring treatment for infected patients, providing preventive measures where possible, and managing public perceptions in ways that maintain an appropriate balance between the extremes of provoking exaggerated panic or fostering a false sense of security. Historians exploring these questions will focus on the tension between the actions and intentions of public health officials and the perceptions and responses of the population, with the goal of understanding how these tensions shaped attitudes and behaviors among a range of participants. Under Robertson’s direction, the city also produced warning placards for display in theaters and other public spaces. This study of the reported statements of Dr. Robertson can address questions relevant to understanding both the historical context of and public health responses to disease outbreaks. Further research is needed to match up the tone of these statements with the actual course of the disease in Chicago and throughout Illinois. By accumulating larger quantities of text, other forms of data mining, such as topic modeling, network analysis, and tone classification, become more useful for both historical and epidemiological analysis. These methods must always be accompanied by a variety of methods that can explore the range of media through which public health officials communicated with the public regarding disease outbreaks. Through this kind of integrated and innovative analysis, history becomes more useful to researchers and to the public concerned about disease outbreaks and public health responses. Dr. Robertson’s efforts to control perceptions of the 1918 influenza remain relevant to the present day, as public health officials use new forms of social media to provide information about disease outbreaks. The Department of Health of Human Services, through the Centers for Disease Control and the National Institutes of Health, provides lists of “flu basics” for the general public, a map tracking flu activity, and updates disseminated through smart phone apps, twitter, facebook, and other forms of social media. Public health agencies now face the same challenge encountered by Dr. Robertson almost a century ago: meeting the public’s right to accurate and timely health information at a time when reports of unprecedented numbers of cases and deaths threatened to spread panic and undermine public health measures. Dr. Robertson was too optimistic in his early predictions of the impact of the disease, and we can learn from that. His efforts to adjust his message to fit the changing circumstances of the disease provides a historical perspective on contemporary efforts by public health agencies to anticipate the spread of diseases and gauge the need for appropriate interventions. Tom Ewing is an Associate Dean for Graduate Studies, Research, and Diversity in the College of Liberal Arts and Human Sciences and a professor in the Department of History at Virginia Tech.